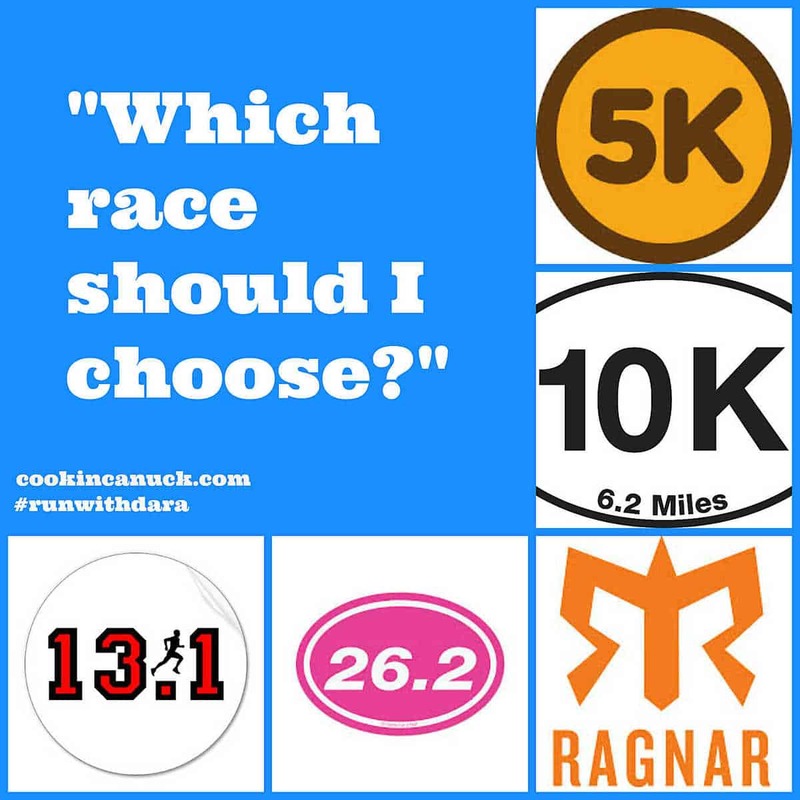 Race season is upon us, and it’s time to set your running goals and choose a race. Here are a few tips to help you do that. In theory, keeping ourselves healthy and in shape should be all the motivation we need to pull ourselves out of bed and lace up the running shoes. But let’s get real…sometimes it’s easier to press snooze and pull the covers over our heads. Let’s sweep those “ifs”, “ands” and “buts” aside, and get down to business. It’s time to sign up for a race. It’s time to commit to something that will motivate us to get our butts moving in the morning. Whether you are planning to race a 5k or an ultra-marathon, take into consideration your current weekly mileage and fitness level, the number of weeks of training available before the starting gun goes off and your personal race history. Find a training plan online, from a certified running coach or in a running book, and make your plan. Do you have enough weeks to focus on speed work before going for your 5k PR (personal record) goal in that race in May? Is your base mileage high enough to jump into a marathon training program right now, or should you work on gradually building your mileage over the next weeks per month (typically increasing weekly by 10% or less each week is recommended)? If running on your own seems about as fun as hanging upside by your ankles for a couple of hours, then check out some of the relay runs, such as the Ragnar Relay Series. If you are starting at the beginning, take a look at these tips and the training plan in How to: Train for a 5k Run. What do you want to accomplish? The answer to this question can range from “have a great time” to “finish my first marathon” to “smash my previous PR”. Set your goals, write them down and look back on them often to remind yourself what you’re hoping to accomplish. I find it helpful to set a few goals, knowing that race day often doesn’t go as planned. Maybe the temperature spikes to 90 degrees F in the middle of the run, perhaps your old nagging injury starts acting up or maybe there are huge lines at the porta-potties mid-race. You simply can’t control every part of the race. Setting goals at a few different levels can help you with feel accomplished at the end of the race, even if you didn’t make your “ultimate” goal. While it can be fun to pack your bags and head off to a new city for a race, there are a few things to take into consideration. How long will it take to travel there and will I be experiencing jet lag? What’s the cost of the weekend? Are there good restaurant options nearby so that I can eat properly in the days leading up to the race? Also, be sure to check out the race maps (and the corresponding altitude changes) and read online reviews about the race. If you feel good about the answers to those questions, then go for it. It’s a great way to experience a new city, to try out different courses and to challenge yourself by running at different altitudes and in conditions that are different from what you typically experience at home. Once you narrow your choices down to a few races, check out the typical weather patterns for those cities during the race month. A marathon in Maui sounds positively idyllic, but how will the heat and humidity affect you during the race? If your goal is to have fun, no problem! If your goal is to set a PR, then weather can become a big factor on race day. As much as runners like to run, they like to talk about running almost as much. Talk to the staff at your local running store, read online reviews and ask runners at your gym. They are bound to have opinions on races with the best courses, the best fueling stations and the most ports-potties (this can be a serious consideration, people!) and the best crowd atmosphere. Online reviews can often be found by Googling the race name and “reviews”. Find fellow runners online or through local running stores (see The Benefits of Running with Others). Some of them may be training for upcoming races. Even if you don’t run the whole race together, it’s highly motivating to know that runners you know are out there on the same course, cheering each other on. Check out organizations such as Team in Training, which provide race training and encouragement in exchange for fundraising for a cause. Often, a group of runners travel together to a target race and provide support for each other. Most local running stores either maintain websites or have in-store handouts that list upcoming local races. See you out there on the course! Really helpful tips, Dara. I’ve never raced! Every time I sign up for a 5k, I get injured… Maybe this will be the year I finally do it. I’ll cross my fingers that this will be the year for you, Liren! Thanks Dara! I have signed up for the Dirty Girl Mud Run with a group of friends/co-workers. I am so excited and really looking forward to it. Your series will be a big help! Thanks.